Many Facebook addicts watch videos on Facebook a lot and some even try to download videos from Facebook on iPhone X. The question comes up: how to save a video from Facebook to your iPhone X? This guide would like to answer to such questions well. You could learn how to download videos from Facebook on iPhone X in different ways. If you’ve searched online for the answer of how to save video from Facebook to iPhone X, you may find that you’re suggested with a lot of iPhone apps that claim to do this well. However, you wouldn’t be lucky enough to get their suggested apps work well on your iPhone. Neither had us. But after tones of tries, we’ve found one – MyMedia app, which could help you easily download videos from Facebook on iPhone. The below steps would show you how to download videos from Facebook on iPhone X with the help of MyMedia. 1. Install MyMedia on your iPhone. It’s free to download. 2. 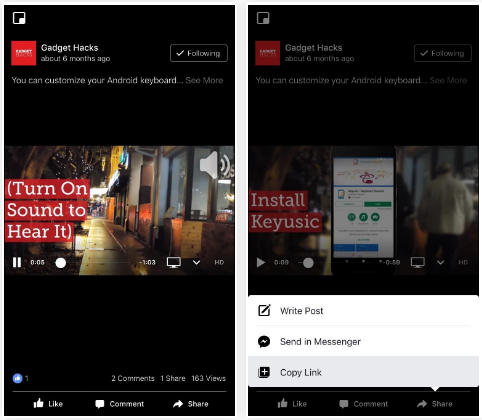 Play back the video on Facebook app you want to download. 3. At the bottom right corner, tap the “Share” button. 4. Then choose “Copy Link” from the menu. 5. Open the MyMedia app, then select the Browser tab at the bottom of the screen and head to one site from FBDown, SaveFrom, and DownVids. 6. 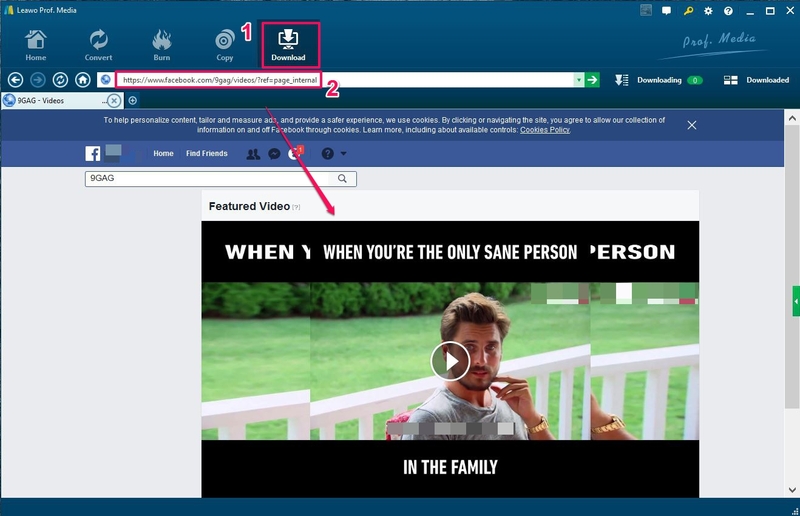 Input the copied Facebook video URL into the blank browser bar by long pressing to click “Paste” button. 7. Click the “Download” button next. 8. Click the “Download the file” option on the popup menu. 9. Name the video on the “Save file as” box and then click “Save” option. In this way, you could easily download video from Facebook to iPhone X by saving the Facebook videos on the Media of MyMedia app. Then, how to save videos from Facebook to iPhone X Camera Roll with MyMedia? You just need to go to the Media tab in MyMedia, tap the file name, choose “Save to Camera Roll”, then the video file will be saved in your iPhone X Camera Roll. Isn’t it that easy to solve your question of how to download videos from Facebook on iPhone? 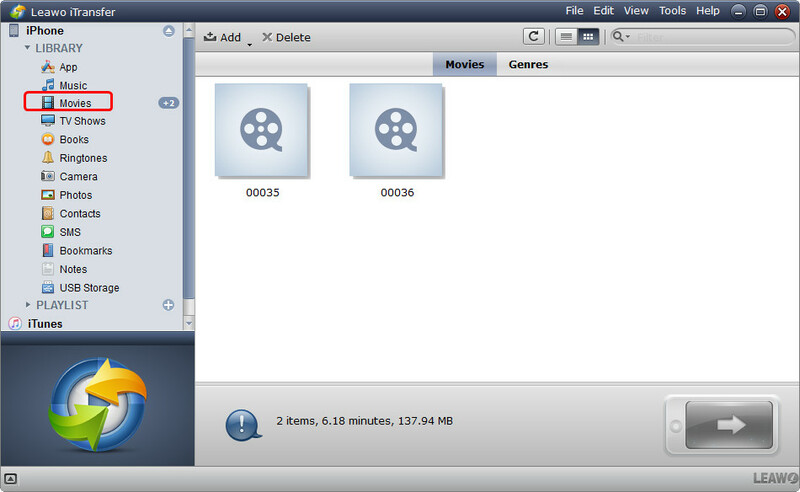 Besides using iPhone apps to answer to question “how to download a video from Facebook to my iPhone”, you could also make use of desk Facebook video downloader software programs, just like Leawo Video Downloader, one of the best online video downloader programs that could download online videos from 1000+ sites, including downloading YouTube video, downloading VEVO video, downloading Facebook video, etc. With Leawo Video Downloader, you could download videos from Facebook to your iPhone X in different resolutions, formats, and quality. Download and install this Facebook video downloader on your computer and launch it. Then follow the below steps to learn how to download videos from Facebook to iPhone. 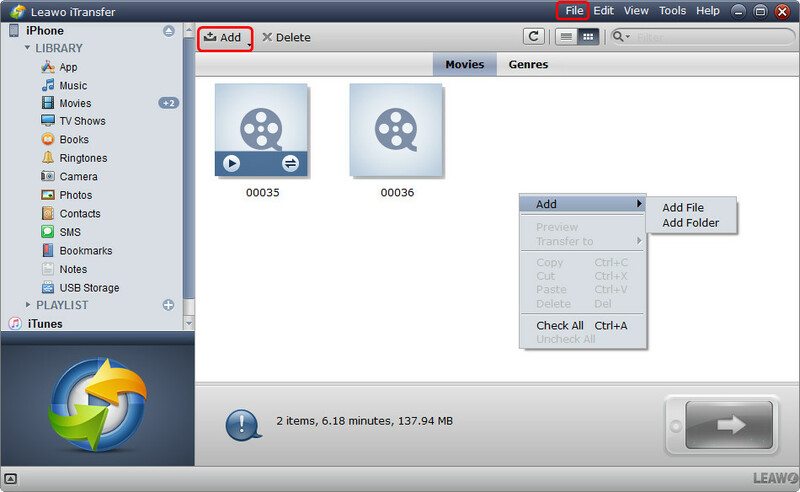 Open Leawo Video Downloader, move mouse to the top-right corner and click on the wheel icon to enter the “Settings” panel. In the “Downloader” tab, set downloading path in the “Save videos to” box. 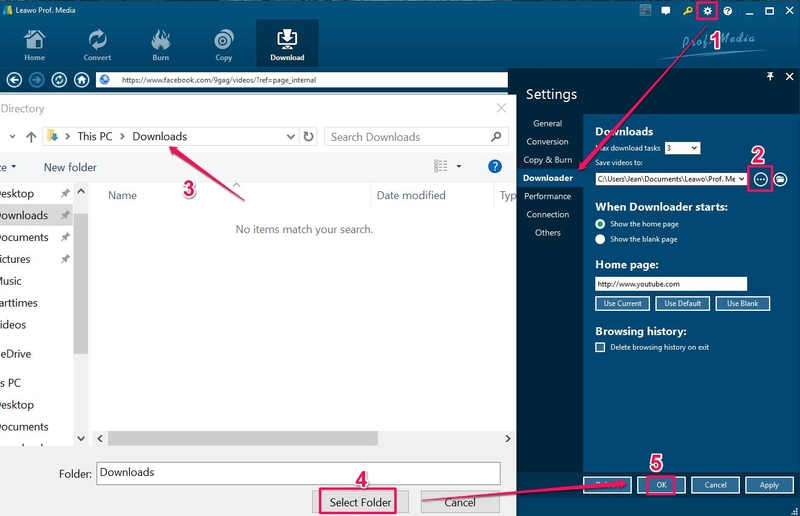 Under the “Download” module, copy and paste the URL of Facebook video you want to download into the address bar to search for it by clicking the Enter button on your keyboard. Play back the Facebook video. On the right sidebar, you could see multiple video options for you to download in different format, quality, resolution, etc. Choose the one you want to download and then click the download arrow to start downloading Facebook video. 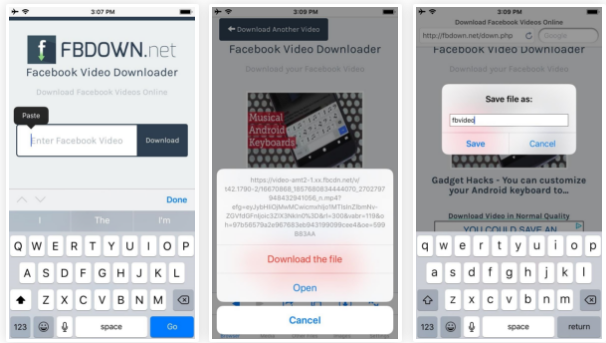 This Facebook video downloader would start to download videos from Facebook immediately. When the downloading finishes, you could then make use of iTunes to transfer downloaded Facebook videos to iPhone. We all know that iTunes could sync contents to iPhone, including videos you’ve just downloaded from Facebook. However, as known to all, the sync would refresh the existing video library, which means previously transferred videos in iPhone X might be deleted. Therefore we would like to recommend you another iPhone X video transfer app – Leawo iTransfer, a professional iOS data transfer app that could easily transfer data and file between iOS devices, iTunes and computer, without any influence upon existing data and files. You could transfer video from PC to iPhone and vice versa with this iTransfer. Download and install Leawo iTransfer on your computer and then follow the below steps to learn how to transfer video from Facebook to iPhone X after you have done the downloading. Launch Leawo iTransfer and connect your iPhone X to computer via USB cable. On the left sidebar, open “iPhone > LIBRARY > Movies” tab. You could then view all movies on your iPhone. Right click on the blank place and then choose “Add > Add File/Add Folder” option to add Facebook videos you just downloaded. Upon adding, Leawo iTransfer would start to transfer Facebook videos you’ve just downloaded to iPhone. When the transfer completes, you could then freely watch downloaded Facebook videos on your iPhone. We’ve provided quite a few methods to help you answer to questions like “how to save videos from Facebook to iPhone X camera roll” and “can you save a video from Facebook to your iPhone”. It’s hard to say which one is better. Facebook video download apps for iPhone X like MyMedia help directly download video from Facebook on iPhone, while Facebook video downloader programs for desktop like Video Downloader might cost your more time since it requires you to download Facebook video to computer and then transfer to iPhone. However, we couldn’t say iPhone apps like MyMedia top desktop Facebook video downloaders since: first MyMedia costs mobile traffic (except WiFi connection), and second, desktop Facebook video downloader like Leawo Video Downloader provides more downloading options in different quality, resolutions, and formats. Anyway, whatever you choose, you’ve learned how to download videos from Facebook to iPhone, right?